We tested seven popular spiralizers to find the best. 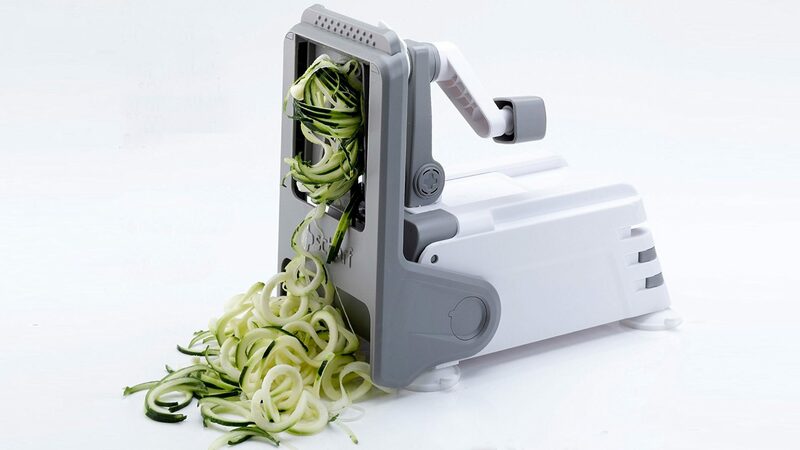 The best spiral vegetable slicer should do more than just crank out zucchini noodles—it should marry design and function so seamlessly that you find yourself looking for excuses to add spiralized vegetables to every meal. We found one model that did just that, as well as a bargain model that’s ideal for compact kitchens. Spoiler Alert: These are the best spiralizers we reviewed. For testing details and methodology, keep reading. The OXO brand has made a name for itself by redefining the standards for common kitchen devices through smart design upgrades—and their spiralizer definitely carries on that tradition. While the basic elements of the OXO apparatus were the same as the other models I tested—molded plastic construction, a hand crank, suction cup stabilization, 3 blades—when it came to function, it outperformed every competitor. It was easy to assemble, the base felt sturdier, the suction grip held tighter, the crank held firmly to every sort of produce I threw at it, and it turned more smoothly and with less force. What's the design tweak that accounts for the improved suction? Rather than one small suction cup at each corner of the base, the OXO model uses a supersized suction cup on the bottom that attaches and releases using a lever and gives a stronger hold. The OXO blades are sharp and come color-coded, which makes it easy to know which blade you are grabbing for at a glance. A small plastic case is also provided for safely stashing the blades when not in use, and it tucks neatly inside the box if you're storing the whole apparatus together. While the price was a step up from the other models tested, ultimately the OXO kit made me want to keep finding new ingredients to slice, and new ways to use them. And I'd gladly pay an extra $10 (and make some room in my cupboard) for that. Oxo Good Grips 3-Blade Spiralizer, at amazon.com. If you're skeptical about having space in your kitchen, but still eager to give spiralizing a try, you won’t regret this ScharfPro model. It performed as well or better than the lower ranking competitors on major tests, cleanly and evenly slicing zucchini, carrots, beets and sweet potatoes with only occasional slips or need for re-adjustment. (One caveat, however: some of the firmer ingredients did require a putting a bit more elbow grease into cranking.) Assembly was intuitive, the on-body blade storage was secure and convenient, and the blades are easy to clean, even after a bit of beet-staining. The factor that clinched the ScharfPro's second-place spot was its appealing, compact design. It is the only model that folds up to reduce its footprint when not in use, making it a perfect compromise between a small handheld spiralizer and a bulky, but powerful full-size one. ScharfPro Folding Vegetable Spiralizer, at amazon.com. Sturdy, with good suction to keep it in place on the counter and sharp blades, the Paderno was a solid contender, and I could see why reviewers on Amazon and the cooks at America's Test Kitchen have given it high marks. If space is not an issue in your kitchen, it would be a solid competitor to my second (more compact) choice, the ScharfPro. A couple of caveats: the suction, while strong, still needed occasional readjustment and the blades sometimes clogged after lengthy use, requiring a little extra cleaning. Nearly identical to the Briefton's model, this spiralizer gets a lot of love on Amazon and was the favorite of Martha Rose Shulman, who used it extensively when developing and testing recipes for her new book, Spiralize This. While certainly serviceable, I found that it didn't perform as consistently well—firm vegetables like carrots and beets sometimes wobbled out of place during cranking, and the suction cup feet invariably needed reattaching. The only model I tried that was set up vertically rather than horizontally, the Mueller felt a little overly complicated. Suction on one or more of the feet repeatedly came loose, the setup of the blade placement wasn't completely intuitive, and some of the attachments (like the juicer and the grater) seemed superfluous. While having the slices and ribbons collect in an attached container seemed like it would be convenient, it might have been easier to let the noodles fall into into a bowl or onto a cutting board. It would had left me with more room to work and fewer parts to clean. Also: The handle squeaked. Though very similar in appearance to the Paderno and Spiralizer models, this spiralizer fell short in performance. The tooth grip on the handle tends to lose hold on firmer vegetables, resulting in uneven cuts and the inconvenience stopping and starting repeatedly. The blades were sometimes extremely hard to change. Toward the end of testing, one became so stuck in place that I eventually just abandoned it, fearing I might lose a finger if I tugged harder. If you're looking for something to crank out zucchini noodles but nothing much more demanding, this model can get the job done. Overall, however, it felt flimsier than many of its competitors—an issue that was not helped by its tendency to lose suction on the counter. Also: while it comes with 3 blades, there are only 2 blade compartments on the body of the kit, making storage trickier and increasing the risk of accidental cuts or injury. Originally invented in Japan, this specialized slicer has gone from being a niche gadget beloved by vegans and nutritionists to a mainstream kitchen device in only a matter of years. Trying to cut carbs from your diet? Spiralizers make it a cinch to create vegetable ribbons for stir frys, salads, stews, and low-carb "pastas." Depending on the type of blade you use, it can also make quick work of basic prep tasks like slicing, grating and shredding. There’s even a whole cookbook genre to devoted to spiralizing and an army of bloggers dedicated to coming up with imaginative new ways to put the tools to use. If you already have a food processor or mandoline in your arsenal, is it really worth making room in your budget—not to mention on your kitchen counter—for another piece of gear to the same job? I set out to survey the spiralizer landscape, hoping to identify the best value and which model, if any, was worth a permanent place in a modern cook's kitchen. To assemble the list of contenders and determine best-designed spiralizer on the market, I dove headfirst into the thriving spiralizer media marketplace, poring over cooking manuals like The Spiralized Kitchen and Inspiralized, as well blogs like Pinch of Yum, Skinny Taste, and Nom Nom Paleo. I spoke to the nutrition-minded cooking authority Martha Rose Shulman, the author of Spiralize This and longtime "Cooking For Health" columnist for the New York Times. And I also consulted user reviews on Amazon and roundups on other established culinary and consumer websites including the Kitchn, Cooks Illustrated, The Telegraph, Good Housekeeping and The Sweethome. As the demand for spiralizers has exploded, so has the supply: Shoppers now have more than a dozen models from which to choose. At first glance, many of them look nearly identical. Luckily most machines fall into two general categories: countertop models and handheld models. Countertop models are about the size of a large shoebox and operate in much the same manner as an old-fashioned apple peeler, with a toothed grip to the produce and a crank handle that guides the fruit or vegetable against the blade. 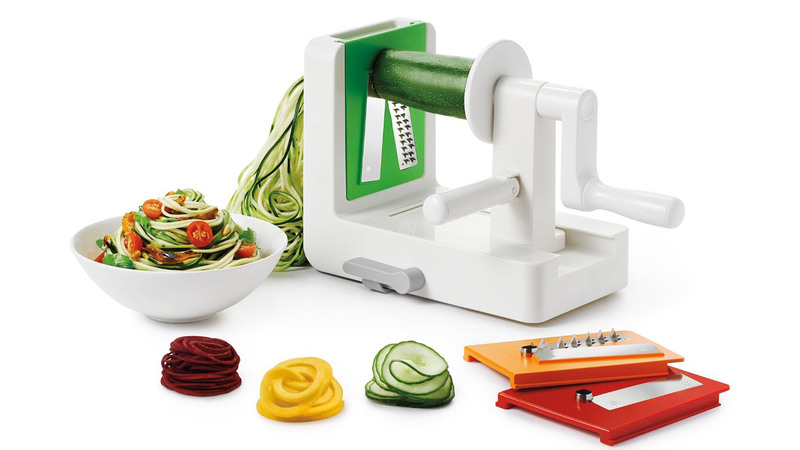 All the spiralizers I surveyed included the 3 most common blades: a flat one designed for wide "fettuccine"-type slices and veggie chips, plus both small and large julienne blades, capable of producing delicate "angel hair" and all-purpose "spaghetti" vegetable noodle shapes. A couple of the models tested include additional blades for coarse and fine shredding. Moderately inexpensive but not super cheap, all the handheld models fall, generally, in the $25-$45 price range, and are constructed from a similar molded white plastic. 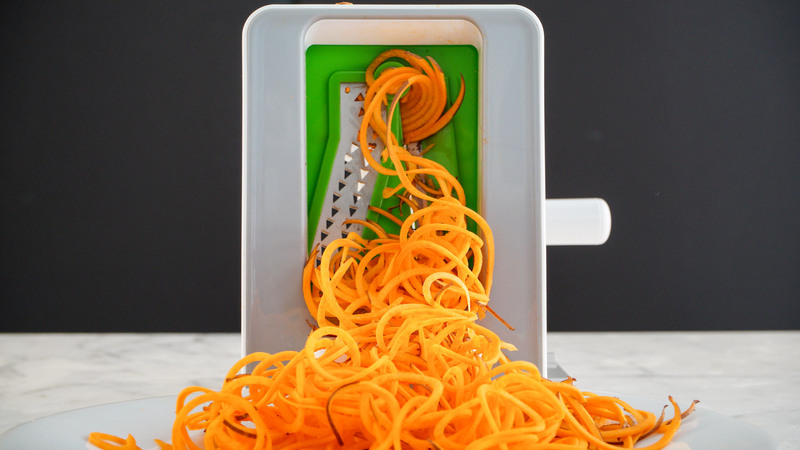 "Considering that the spiralizer is a device that centers around a murderously sharp blade, the relative stability and sturdiness of each model was a prime consideration." Handheld spiralizers are much more compact and are designed to fit in the palm of your hand. They require the cook to put more muscle into the job—which is fine when you're working with tender produce like zucchini and cucumbers, but can end in tears with something firmer, like butternut squash, turnips, or beets. Finally, because handheld spiralizers generally have only one, fixed blade, the variety of shapes they put at your disposal is necessarily limited. (Note: OXO makes a handheld slicer with one, two or three blades—but at $29, it can’t compete with a similarly priced countertop model for value.) Ultimately, the main selling point of handheld spiralizers is their convenient, compact size. If you suspect you might reach for the gadget on a less regular basis—or, if kitchen real estate is at a premium—a handheld slicer might be the right choice for you. Considering the central element of a spiralizer is a sharp blade, the relative stability and sturdiness of each model was also a prime consideration. Most countertop spiralizers rely on a system of suction cups to affix to a work surface for wobble-free cranking. Models that dislodged during use were automatically downgraded (though ones that were impossible to remove after the work was finished also lost a point for minor annoyance). Another factor that seemed essential to stability was the weightiness of the base: models with smaller, lighter bases tended to feel off balance in comparison to their heftier counterparts. 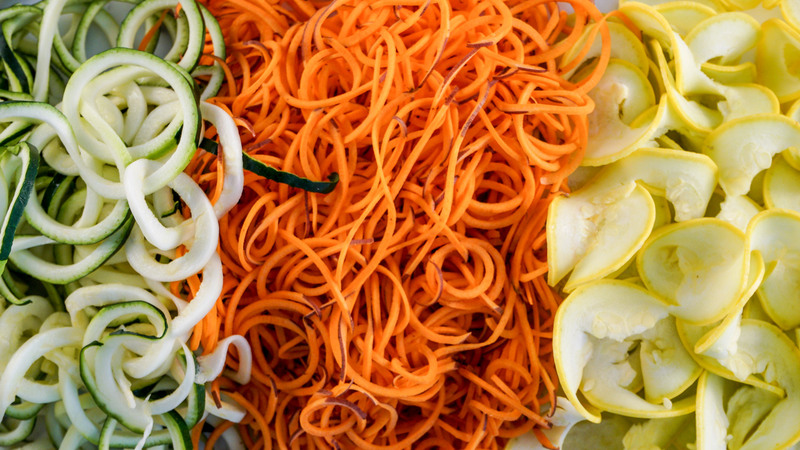 A worthy spiralizer should do more than just crank out zucchini noodles—itshould marry design and function so seamlessly that you find yourself looking for excuses to swirl, shred, and slice, adding vegetables to every meal just for the fun of it. And we found one model that did just that, as well as a bargain model that’s ideal for compact kitchens. Over the course of three days, I sliced and swirled my way through a variety of fruits and vegetables, including tender zucchini and squash, carrots, beets, sweet potatoes and Granny Smith apples. (And afterwards, used the haul to make big batches of veggie chips, fritattas and grated salads.) With all the models, I paid close attention to the smoothness of the cutting action, the sharpness of the blades, the size and sturdiness of the overall apparatus, and the ease of cleanup. When it came time to slice, the best models sliced both softer and firmer items evenly without requiring a lot of stopping and starting. Their crank system turned smoothly, and didn't drop the produce or wobble out of position. (Or, my pet peeve: squeak.) I also considered the sharpness and variety of the blades. All of the models I tested came with the three "essential" blades—but having more options wasn't necessarily a plus. Clever blade storage also won points. To prevent accidental injuries, I looked for spiralizers that provided somewhere safe and convenient to stash the blades when not in use—preferably on the body of the base. While rinsing and cleaning the blades was invariably fussy, no matter the model, I evaluated how easy the crevices were to clear and how well the blade's plastic surrounds withstood staining and scratching. The bottom line? 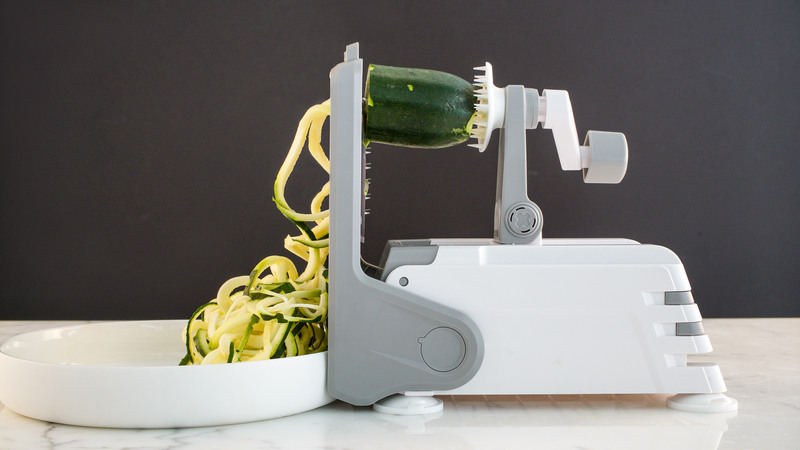 To earn its keep, a worthy spiralizer should do more than just crank out zucchini noodles—it should marry design and function so seamlessly that you find yourself looking for excuses to swirl, shred, and slice, adding vegetables to every meal just for the fun of it.